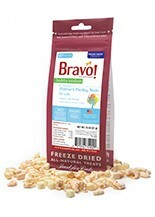 Want to treat your feline friend to a savory, freeze dried snack with nutritional benefits that can’t be beat? Break out a bag of Healthy Medley treats! Our Chicken Medley and Turkey Medley recipes take nutrition to a whole new level by including nutrient-rich organs as well as muscle protein. While Mariner's Medley is made with three different types of seafood muscle protein: salmon, cod, and shrimp. Since freeze drying (when performed properly) doesn’t degrade essential proteins, fatty acids or enzymes, all their original nutritive value has been retained in the most bio-available form for felines. *Federal regulations prohibit the use of hormones in seafood. Feeding guidelines: Owner should always supervise their pet when feeding treats. Treats should be no more than 10% of your cat’s daily calorie intake. These treats are not a substitute for your cat’s main meal. They are for intermittent or supplemental feeding only.